TRANSFORMS A HARNESS AND WING INTO A RIG CAPABLE OF SIDEMOUNTING TANKS. The Nomad Buttplate weaves through standard 2" harness webbing on the waist strap and is locked into place using stainless steel TransPac assembly screws through slots on the backplate. once tanks are mounted on the buttplate, they are held in place by the Nomad tank bungees, which run from a D-Ring or similar attachment point on the back of the upper shoulders to a standard shoulder D-Ring on the front of the harness. 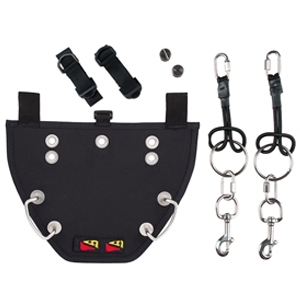 The Buttplate & Bungees comes standard with our Ring Bungees and Tank Chokers.